Each morning for the past five years, Day Schildkret has walked his dog through Wildcat Canyon in Richmond, California, carrying a basket. As they walk, he forages for “local objects that the wild world has discarded to the earth: feathers, leaves, flowers, bones…” Once he feels his basket is sufficiently filled, he clears space on the ground, takes a moment to quiet his thoughts and listen to his surroundings. Then, he arranges the pieces into the most magical mandalas, altars he offers to the world and allows to disperse by natural forces. “The resurgence of these objects, colors, textures, shapes into a collaboration of proximity can bring forth new forms of beauty and memory,” Day says on his website. The mandalas he creates are strikingly beautiful. The vibrancy of the colors might make you wonder how you could have missed such flare on your own walks through the woods. Since the availability of materials depends on the season and the completely unique events that preceded Day’s arrival, each altar is distinct. “The practice of building my art is a practice of obeying the place and time I am in. Every object I use is discovered in or around the place I build it. Every altar I create is informed and governed by forces larger than me: the sun, the wind, the rain, the traveling creatures, the season, the unexpected and unpredictable, etc. It is an honest dialogue between the human and non-human world and an ever-changing conversation with moving pieces,” Day says. His work has evolved from this daily practice. 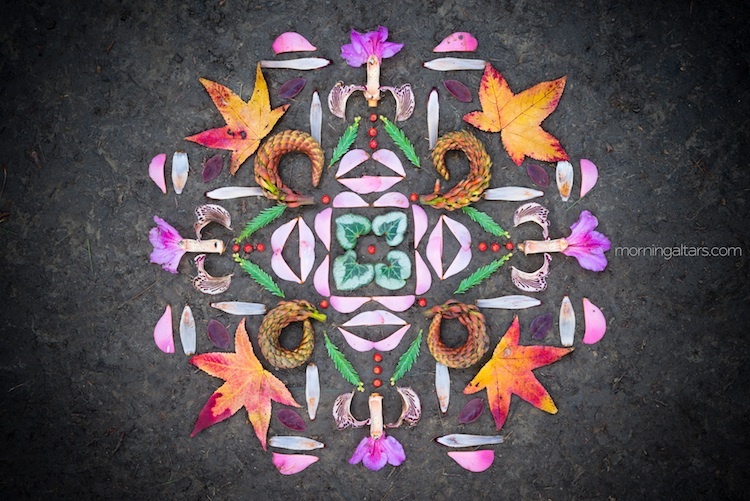 He has built earth mandalas at multiple festivals, including an American and Canadian tour with the Wanderlust Festival in 2016. He also creates privately commissioned installations for weddings, birthdays, and other events. This is the vital, ongoing process of nature – biological decay feeding new concentrations of energy – put into a form that allows humans to more easily recognize the beauty of it all. These physical altars last only a short while, and only those fortunate enough to be walking by get to enjoy them. Thankfully, photos can retain and deliver the message to the rest of us who aren’t at that place and time. Enjoy the photos below, and visit the MorningAltars website for additional images and more information about Day’s inspirational work. On Friday, January 28th, Day Schildkret will create an altar in conjunction with the release party for East Forest’s new album, “Held.” This will be followed by an event on Saturday, January 29th called, “Beauty in the Darkness: Crafting Earth Altars in Troubled Times.” If you happen to be in Portland, Oregon, these events are not to be missed.